Marinco Frequently Asked Questions | Marinco marine products frequently asked questions. Welcome to Marinco’s frequently asked questions page. Search Box: This is going to be the quickest way to locate exactly what you are looking for, type a few key words and select the FAQ that best matches your inquiry. Recent Posts: This the most recent questions to be answered. Categories: This will allow you to browse based on a general subject, and see all of the FAQ’s relevant to that topic. If those three fail, shoot us your question and we will work to get it answered and added to our growing knowledge database. Do you have an RMA question? See this post. Do I need a Returned Materials Authorization number (RMA#) prior to returning a product for warranty evaluation? Prior to returning any product for warranty evaluation a RMA (Returned Materials Authorization) number is required. To obtian a RMA please start by going to the link below and filling in the required information below and then submit the form. A email will be generated and sent to the warranty department. Once reviewed and all questions have been addressed. The warranty department will respond with a RMA number along with a form to be put in the box and the location to send the defective product. Proof of purchase is required for all returns. All returns must be within the warranty period of the product. 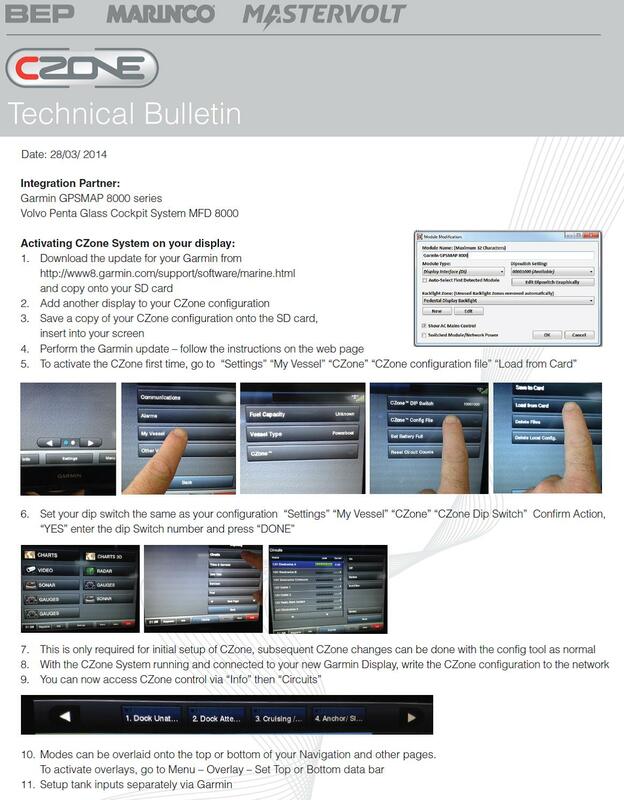 Attached is a step by step power point on how to add a NEW Garmin display to a Czone system . Equipment needed: Laptop, SD card depending on the display, and a card reader . You will also need the Czone configuration tool software. How to replace a Garmin display/MFD when you CAN access the dipswitch of the original display. Below is a step by step how to replace a Garmin display when you have access the dipswitch settings of the old screen. 1. Ensure the Firmware on the replacement device matches the Device to be replaced. This link will explain how to do that: How to determine the firmware version of a Czone module. 2. Turn off power to module. 3. Disconnect all wiring connections then remove the faulty module. 5. If the module is an OI or a MOI remove the fuses from the failed module verify that the fuses are good and fit in the same locations on the new module Warning: Do not put the wrong amp fuse in the wrong location as the fuses need to stay matched to the load. 6. Mount the new module and connect all wiring except the NMEA cable. 7 Apply power to Czone system. 8. (If the unit is new this step can be skipped.) Ensure all the dipswitches on the module are switched to the off position. Once mounted temporarily connect the NMEA cable until all the indication lights flash once. Then remove the NMEA connection. This has now wiped any program that may have been on the module. 9. Set the dip switches to match the settings of the replaced module. Once the dipswitches are set plug in the NMEA cable. After a short period of time the new module will begin to flash several times while receiving a copy of the program from the network and after updating will begin to functioning normally. How do I determine if the firmware matches between the Czone replacment module and the module already in the system. ? If it doesn’t match what should I do? The firm ware info can be seen via the “Setting” menu on the Display Interface screen. By selecting the “Network” tab a list of all the modules on the network will be displayed. Select the old device for removal. The version number is the Firmware. All new modules supplied from the factory will have the latest firmware. If the Firmware is incorrect it will need to be matched or updated via the configuration tool. If the user has the configuration tool or is familiar with configuration tool they will be able to update the Czone system them themselves. Otherwise contact your nearest distributor to have the system updated. Below is a power point on how to trouble shoot the CZone digital switching system. I went through this training an found the Powerpoint to be very helpful. so I decided to it add it to the FAQ page here. If you do have any questions on the Power Point or the Czone digital switching system please leave a comment below. Also if you have any experiences troubleshooting the CZone system let me know and I will post them here to help other techs and Czone users out.